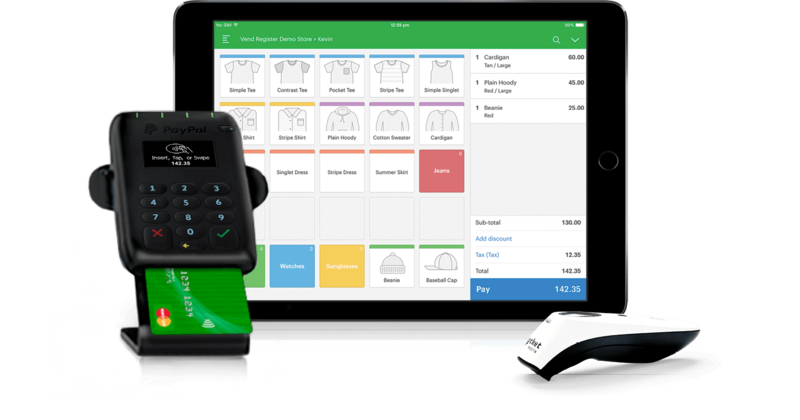 Transform your business with Vend POS + PayPal. Vend + PayPal are better together. Sign up with Vend to claim your free 14 day trial, or register your interest to get exclusive PayPal rates on all transactions. The more you sell, the less you pay. Unleash the power of mobile retail with Vend POS + PayPal. Bring the checkout to your customers with Vend POS. Take your register anywhere; it’s easy to use and optimized for iPad. Accept the latest payment technologies with PayPal, including contactless payments and Apple Pay. Now EMV-certified for secure chip card payments. Sales and returns flow from Vend to your card terminal, so there’s no more fumbling at checkout or manual reconciliation at the end of the day. Manage inventory, track bestselling products and top employees, and stock by location with robust reporting and inventory management. EMV-certified to keep you protected. Start selling right away with Vend’s easy setup. Vend users can link existing PayPal accounts in real-time, or have new accounts approved in minutes. The more you sell, the less you pay. Accept card payments quickly and securely on the go and only pay a small fee per transaction. Avoid monthly fees and lock-in contracts. Accept contactless payments like Apple Pay. Take Mastercard, Visa, AMEX, and Discover. *Processing more than $10k? Talk to us about our exclusive rates. Christina Ruiz, Top Shelf Boutique. Register your interest today, and get exclusive PayPal rates on all transactions.